Scrabble Solution - Scrabble Solution can create and solve puzzles that are often included in newspapers and other publications. It's great as a companion for Scrabble games and can help to find that 'ideal' score. Countdown Solution - Countdown Solution is a great tool for solving all of those challenging puzzles on that famous Channel 4 programme - now you can keep up with Carol and the rest of the team ! Countdown Solution can also create your own puzzles. Classic WordZap - A word game where you race your computer opponent to create the most unique words from a given set of letters. When opponents make the same word, it is Zapped from both lists. 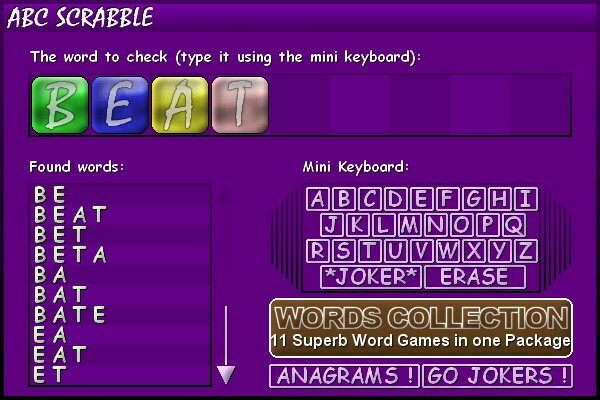 WordZap Deluxe - WordZap(R) 6.83 is a Shareware word game where you race your computer opponent to create the most unique words from a given set of letters. When opponents make the same word, it is Zapped from both lists. Keyboard input and beautiful graphics! 5 Star Word Engine - Think you're pretty good at Scrabble? Hardly anyone can beat you at Boggle? Then try this one! From a randomly selected set of letters it is you versus the computer to find the longest word. Warning: The game is highly addictive!